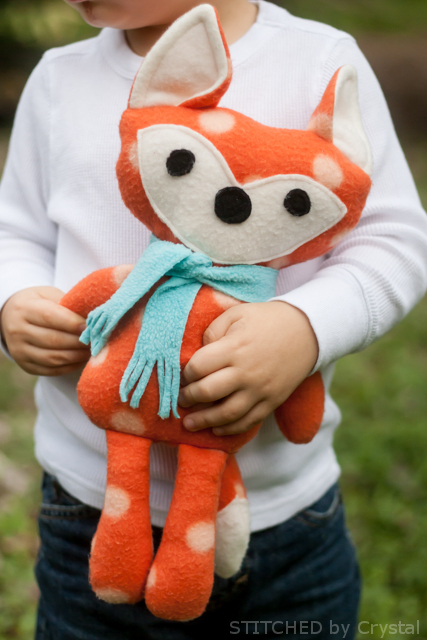 Woodland creatures are really trending right now and that sly fox seems to be the real favorite. 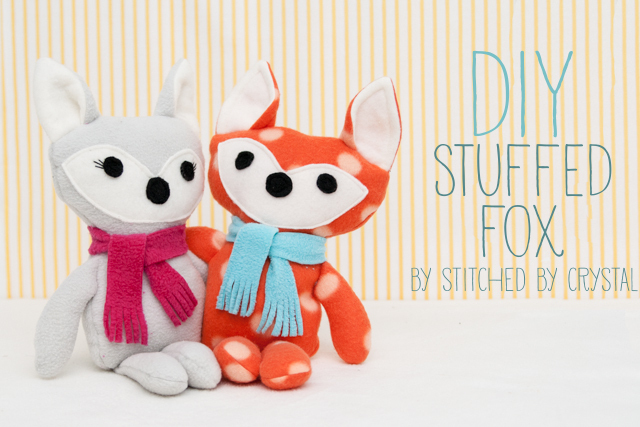 Looks like I have jumped on the fox bandwagon...I made these adorable little stuffed foxes for my kids and have a pattern to share so you can make some too! 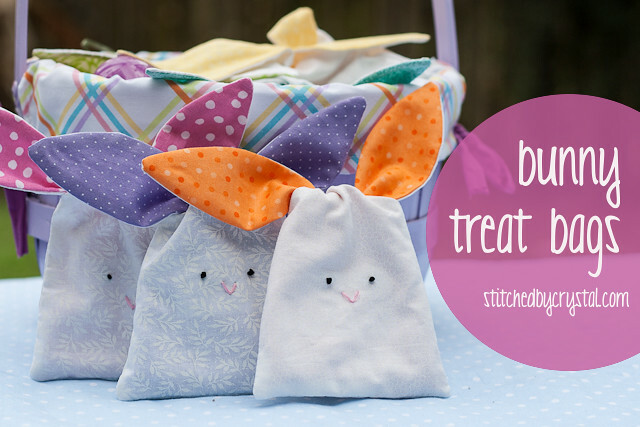 These guys are so easy to make and have been a big hit with my kids. They have both been so pleased with their new toys and these foxes have been drug all around town for the past few weeks. 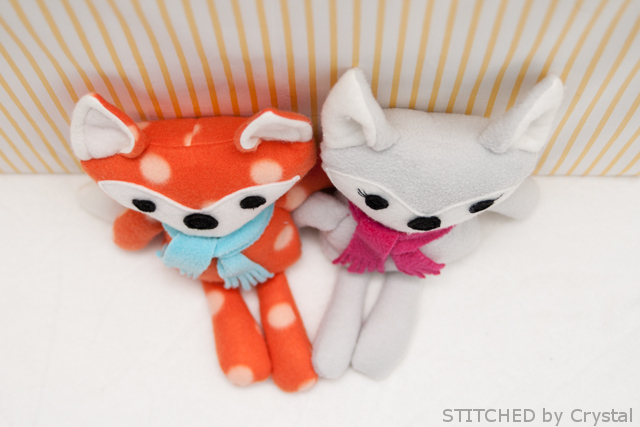 They are about 15" tall and are made from soft fleece and they are super snugly. And with their fuzzy scarves, they are dressed for the season! You could use buttons for the nose and eyes, but I appliqued on some fleece so they are baby safe. 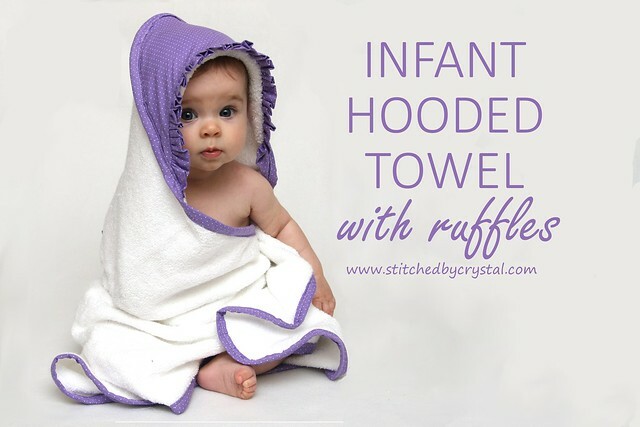 They would be such a cute shower gift for a mommy to be, just make sure you stitch down his scarf too or skip it all together. I have made other stuffed toys in the past (like the rag doll bunny and Seamus) but these guys are for sure my favorites! 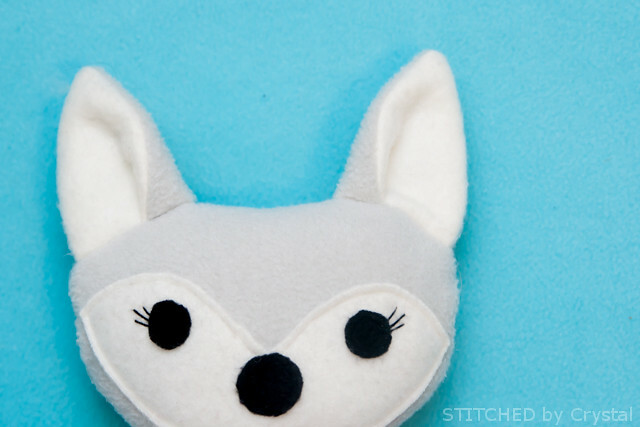 Want to make a fox of your own? 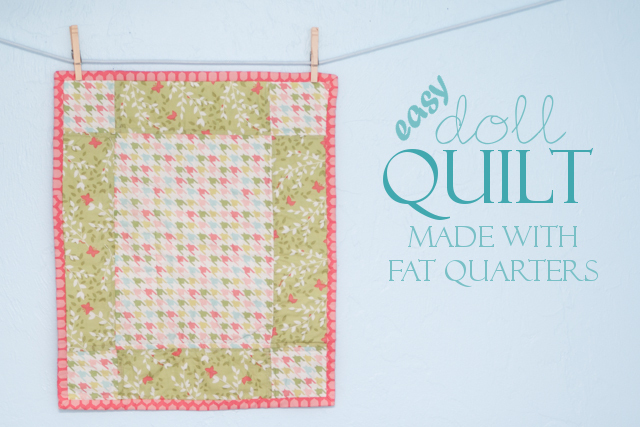 You can find the pattern and all the instructions to make one by clicking HERE. It is a PDF download, so you need to have a PDF reader to open and print it. You can download adobe reader for free. 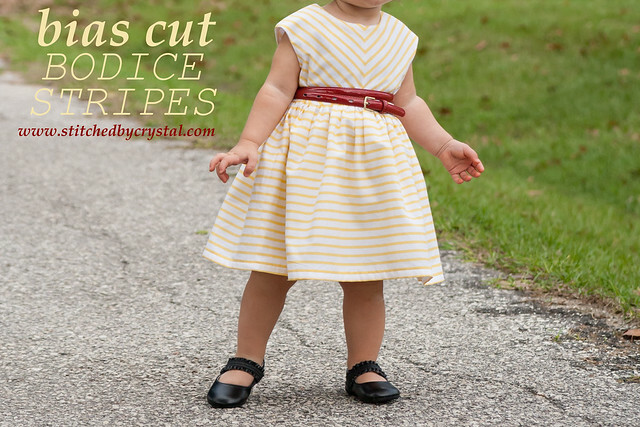 The pattern includes 1/4" seam allowances. 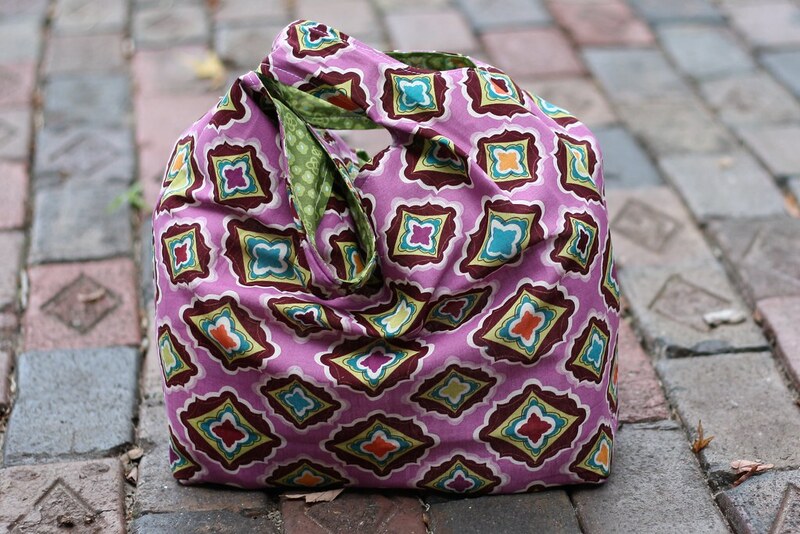 Go download the pattern and make it now, or save it to your computer and sew it up later. So adorable! I love to make stuffed animals--thanks for the pattern, much appreciated! They're really lovely ! Thank you for the pattern ! Very pretty and looking like original and natural pictures about Stuffed Fox. Its really very nice pattern, can you share images of the rag doll bunny with us? I want to share that images with my academic students, who are looking for best essay writers UK at Essay writer. I would like to recommend this website to more people. Thanks for sharing here. Thank you for the amazing fox pattern. I just love it! Absolutely darling!!! Thanks so much for sharing! Oh my goodness! This is just adorable! I will be using it to make some fluffies for Hopeful Threads. Thank you so much for generously sharing with all of us! The link works through my google chrome, but will not let me print. Can you email this to me? Yes! I will email it to you. Leave me your email address or email me and I will send it! This is soooooooooooooo adorable! Is it possible to have it emailed to me as well? I can't seem to open it! Thanks! 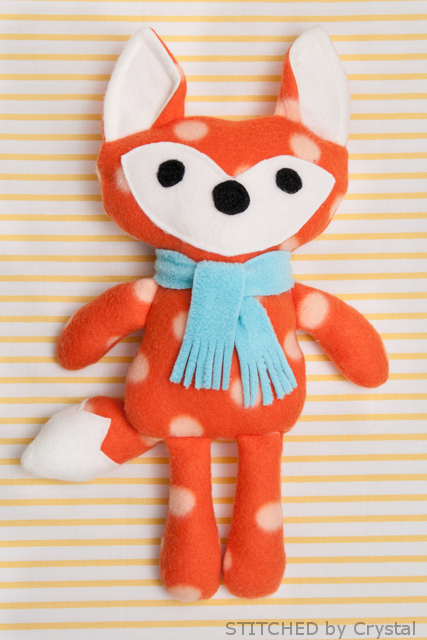 this fox is so cute, already made one for my daughter, she is delighted!! 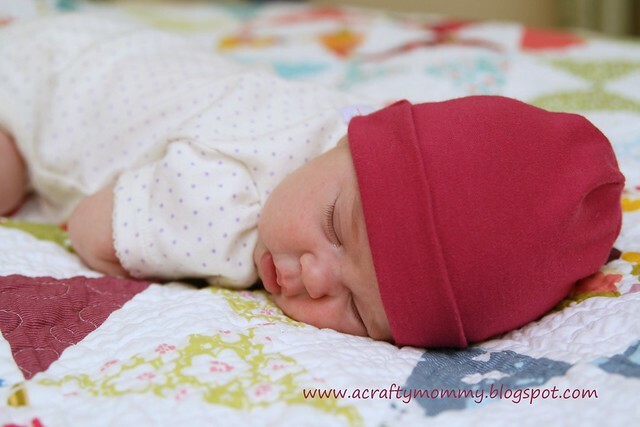 thank you for pattern..
thank you for the darling pattern, it will be perfect in the nursery my daughter is planning. How incredibly sweet! 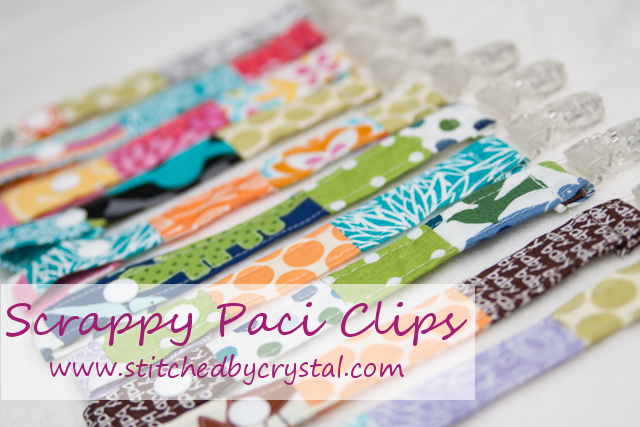 Thanks so much for sharing the pattern, Crystal! Sure! But I would still use a fleece or felt for the face and the tail contrast because it won't fray. Thank you very much ! Love from France ! I have to do this asap! Thank you very much for this pattern! 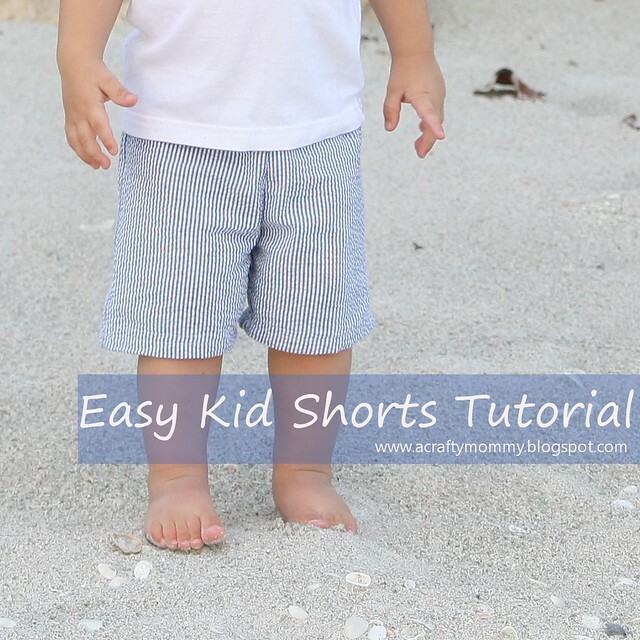 Hello, Great pattern I am making these for my kids! How important is it to used stuffing pellets in the hands/feet? I Love it, but the link works through my google chrome, but will not let me download. Can you email this to me? Very cute pattern. I made one! I used woven cotton which shows all of my beginner mistakes when turned and stuffed, but it was fun and the directions were easy. The left ear and leg are a little wonky due to placement, but I'll have a better feel next time... and I can't wait to try with fleece! Thank you for sharing!!! Hi there! Thank you for providing this great pattern, he sure is adorable! 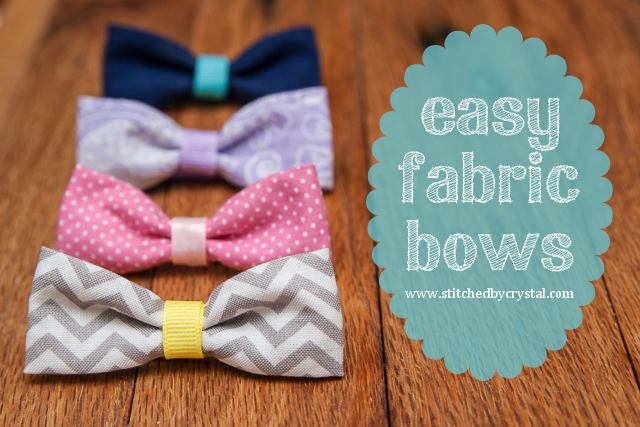 I am sewing one up for a friend tomorrow using flannel. I am excited to see how he turns out! I made one of these for my daughter to take into the hospital with her when she went in for surgery. I tweaked it a little to make it look like a kitten since she loves cats. Thank you so much for the pattern and tutorial. It was easy to follow and looks adorable. My daughter loves it. I can't access the pattern either, can you email me? Just wanted to say thank you for the adorable pattern! I came across it on Pinterest this afternoon & whipped one up in a few hours. Your directions were clear & easy to follow. My daughter loves her little fox! Thank you so much! Just finished making one out of satin for my baby. He loves it! 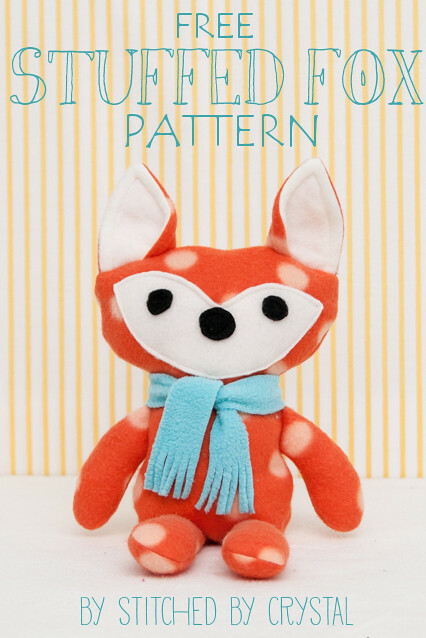 AI love this- my daughter is havingh a fox theme- thought I would make her baby D this, but I can't access the pattern!. Can you send to me? Thank you for this lovely idea. I have up cycled a fleece jacket I no longer had use for. He is perfect. I used white fur for the face, ear inners and tail end. I think I see the demise of another fleece jacket. It's blue, but hey, why not have a light blue fox? SEW cute! I can not download it either way. Please email if you still do that. Thank you. Hello! 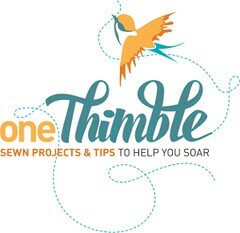 Thanks so much for this, can't wait to make one for my friend's new baby! But I only get the whole webpage, can't print it...Could you email it to me too please? Thanks so much!!! hermoso trabajo !!! Gracias por compartir querida amiga.. Cute pattern, thanks for sharing! I'm am new to sewing and I'm struggling to understand the pattern. Can anyone explain the parts that say "cut 1 on fold"? It just looks like a little flap that I would have to cut out and then I can't understand how I would sew it together. i was wondering if you could email me the fox pattern? ive tried different browsers without any luck. 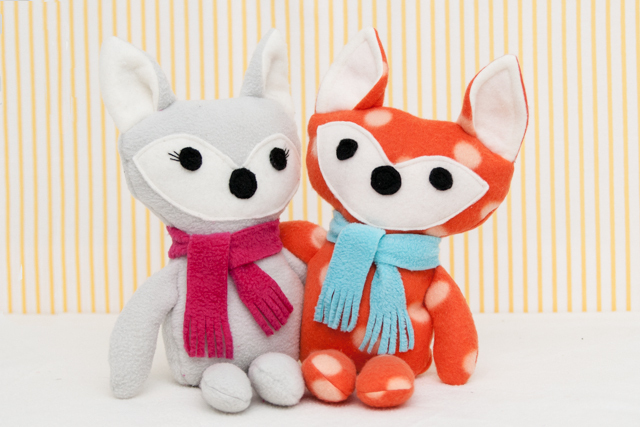 my daughter is obsessed with fox's and id love to make this for christmas. my email is angiedini79@gmail.com. thank you so much if you can. You are very generous. Thank you for providing the arctic fox pattern. My grandson needs to make one for his third grade class project. This will work beautifully. چاپ دیجیتال به سرعت بسیار زیادی نقش بازیگر اصلی را در صنعت چاپ به عهده گرفته است. به صورت گسترده ای هم در خانه ها با چاپگر های خانگی مورد استفاده قرار می گیرد. شرکت های بزرگی مثل Epso و Canon دستگاه هایی را هم برای استفاده در خانه و مراکز چاپ دیجیتال تولید می کنند. تکنولوژی چاپ تا حد زیادی در هر دو حالت یکسان است. به عبارتی دیگر شما می توانید تکنولوژی چاپ دیجیتال را با مقیاس کوچکتری در خانه های خود استفاده کنید. کاتالوگ‎ ‎ابزار مهمی در معرفی و اطلاع رسانی در حوزه های تولید و خدمات است. کاتالوگ ها قبلا شبیه به تراکت و محدود به یک برگه پشت و رو با جلدی همانند پوستر بودند، اما امروزه چاپ کاتالوگ دارای صفحات و تنوع بیشتر در شکل و طرح هستند و انواع صحافی بر روی آنها اجرا می شود. چاپ بروشور‎(Brochure) ‎دفترچه یا برگه ایست (معمولا به صورت تا شده از چند جا بر روی خود) برای ‏ارائه توضیحات کاملی درباره یک محصول و نحوه استفاده از آن و بر این اساس به آن کالانما هم گفته می ‏شود . یک کاربر پس از خواندن بروشور محصول، می تواند از آن محصول استفاده کند. در چاپ پارچه که به سابلیمیشن ‏‎ (sublimation)‎معروف است می توان بر روی انواع ‏پارچه در ابعاد کوچک و بزرگ طرح ها و تصاویر مورد نظر را چاپ کرد.‏ بهره مندی از طرح و نقش و تصاویر جذاب بر روی پارچه ها همواره مد نظر تولید کنندگان و مصرف ‏کنندگان پارچه و صنایع مرتبط با آن، مثل پوشاک و عرصه تبلیغات، بوده است.‏‎ ‎در دستگاه های چاپ دیجیتال امکان چاپ انواع تصاویر، نقوش و طرح ها بر روی پارچه فراهم است. پارچه های مناسب برای ‏چاپ دیجیتال پارچه هایی هستند که دارای درصد پلی استر بالا (حداقل 70 درصد) و رنگ های روشن ‏باشند. norton.com/setup - for norton setup, go to norton.com/setup and sign in or login to your record, setup, download, reinstall and regulate norton features.